Thank You for joining the 5th Annual Palm Desert Century (PDC). We're pleased to report a strong field size of 430+ registered riders. We're nearing a sell-out field of 600 riders by Sat. Please check your Name & Bib # on the Riders List. MANY THANKS for your help spreading the word! There's a special discount coupon for your friends & family at the bottom of this email. SPECIAL NOTE: California & Municipal Permitting & Traffic Control requirements are at an all time high due to incidents & tragedies at other events. The cost of producing a Safe & Fully-compliant cycling event has skyrocketed! Now, more than ever, please encourage your cycling friends to join you at the Palm Desert Century for a SAFE & WELL-ORGANIZED ride. Shadow Tour has ALWAYS PLACED YOUR SAFETY & COMFORT ABOVE EVERYTHING ELSE! With just 5 days until PDC rolls on Sat, Nov 14, '15, it's time to provide one last email with important final details about the ride. Please take about 30 minutes to carefully read this email & study your Rider Instructions. Also review the Course Strip Map, containing vital course, and support details. 1. 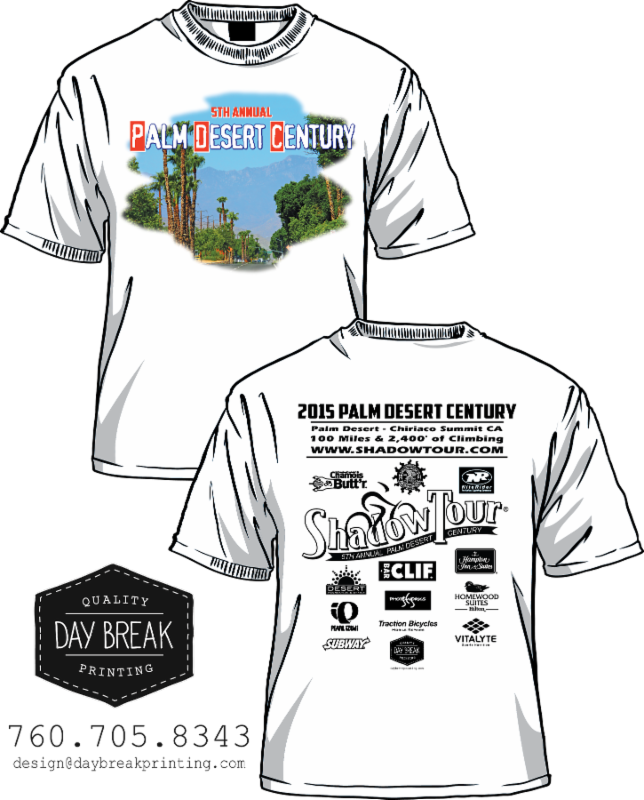 Weather: Experienced Shadow Tour riders know a desert century is ALL ABOUT THE WEATHER! The weather picture looks excellent for ride weekend, lots of sunshine & warm in the afternoon. As of Tue, Nov 10th, Accuweather forecast for Palm Desert on Sat calls for "Plenty of Sunshine", Lo 45F, Hi 78F. Winds will be light & variable from the NNW at 2-6 MPH. Desert weather changes frequently, click here for up-to-date forecasts. a. Clothing: Expect a cool A.M. & warm P.M. At the minimum, we recommend starting with a light base layer under your jersey, arm warmers, and a wind vest. d. Gear Drop: There will be a gear bag drop at the Start, near the Reg Tent, and at REST STOP #1 ONLY (NO OTHER REST STOPS). Do not leave valuables, as we cannot guarantee security. Write your Name + Bib # on the outside of the bag. At Rest Stop #1, gear bags are picked up at 10:00 A.M. and returned to the Finish in Palm Desert. Do not ask vol's to accept gear bags after 10:00 A.M, nor at any other Rest Stop. e. Return Ride to Palm Desert: The current weather picture suggests tail winds on the outbound direction, with mostly side & headwinds returning to Palm Desert, depending upon where riders choose to turn around. The desert is NOTORIOUS for unpredictable temperature swings with headwinds and side winds all the way back from Chiriaco Summit to Palm Desert. Be mentally ready! f. Plan Your Ride & Ride Your Plan! The weather forecast is the Desert being the Desert. During 21 previous desert events, Shadow Tour riders have learned that desert weather is always tricky! On Sat, riders need to be ready for anything. Preparation & Flexibility are key. First, see how you feel on Sat morning. Bring & wear extra clothing in layers to retain warmth, if it's cool when you arrive. Next, evaluate the weather that you actually see & feel on Sat morning. Third, break your ride down into smaller pieces. Take it Rest-Stop-by-Rest Stop, or even hour-by-hour. Constantly reassess how you feel. Err to the side of caution by turning back early. At Rest Stops, check winds in the direction of the return trip. The return ride is usually more challenging, especially for full course riders. If in doubt, make a Safe & Legal u-turn, and ride back to Palm Desert. g. Event Director Pre-rides: Here's a link to pre-rides of the Palm Desert Century full course, downloaded to Strava. Be watchful for sand (and debris/hazards) on the edges of the road all along the route, but especially on Box Canyon segments. Riders wishing to get EXACTLY 100.0 miles, ride about 4/10ths of a mile past the turnaround, to a point just before Interstate 10 Freeway on/off ramps. Or, add about 8/10ths total once across the finish line in the closed road lanes inside University Park. a. Host Hotel: The Homewood Suites, by Hilton Palm Desert, located adjacent to University Park, has a few remaining rooms. Special rider rates start at $129 + tax. Click here for more details on nearby event hotels and special rider rates. b. Arrival Coffee: On Sat, Palm Desert High School PTA Foundation Vol's have arranged for coffee generously donated by Starbucks. The Vol's will set up the coffee station after 5:30 A.M. at the Reg Tent. Donations are much appreciated! c. Fri & Sat: Pueblo Viejo Grill Mexican Restaurant, located in University Village, near the Start/Finish, is kindly offering a special 10% discount to all PDC riders. Just mention you're with the ride at the time you place your order. Please say "hi" to Caesar or Norma, they've been good friends of PCD since the beginning. d. Hampton Inn/Starbucks/Subway/Arco AM/PM: These businesses are located on Cook St, 1 block south after exiting Interstate 10, at the corner of Cook St & Gerald Ford Dr. The Hampton Inn & Suites Palm Desert is offering a special rate to PDC riders, starting at $119 + tax, based on availability. Starbucks & Subway are offering 10% discounts by mentioning the ride. The Arco Station has (relatively) affordable gas. 3. Parking: Parking lots open at 5:30 A.M. The University Village (adjacent to Start/Finish) has a capacity of 300+ cars. The layout of the lot is elaborate, so be patient finding an open spot. Alternatively, the CSUSB Campus, located on the east side of Cook St, directly across from the Start/Finish, has a large parking lot "Lot B" ONLY. Riders desiring easier parking may park in the CSUSB "Lot B". Vol's will be at the Cook St park entrance directing arriving riders. Riders may select either parking lot, until The University Village lot is full, at which time all arriving riders must park in the CSUSB parking "Lot B". b. Post-ride Expo: Ice cold sodas and donated items will be for sale at the PDHS Tent in the Expo, next to the Reg Tent. You're invited to stop by & learn more. Please help fill the PDHS Donation Jar! Thank You for joining the 5th Annual Palm Desert Century (PDC). We're pleased to report a strong field size of 350+ registered riders. Please check your Name & Bib # on the Riders List. MANY THANKS for all your help in spreading the word! There's a special discount coupon for your friends & family at the bottom of this email. PLEASE HELP SPREAD THE WORD ABOUT THIS RIDE TO YOUR CYCLING FRIENDS! With just over 2 weeks until PDC rolls on Sat, Nov 14, '15, it's time to provide very important specifics about the ride. Please take about 30 minutes to carefully read this email and study your Rider Instructions. Also review the Course Strip Map, containing vital course and support details. We will send one more email in early Nov with final details & updates. 3. Palm Desert High School PTA Foundation: The Official PDC Charity is Palm Desert High School PTA Foundation (PDHS). This is a PDHS primary annual fundraiser to increase school spirit, promote school involvement through clubs & activities, increase student & teacher recognition, and provide positive safe activities creating student life memories. The bulk of 2015 PDC Volunteers are PDHS students, staff, and parents. Let's all return the favor! Here's their Donation link. Click through for yourself. You'll see riders who have already opened their hearts. We send our sincere Gratitude & Thanks. Donating to the PDHS cements the PDC commitment to assist local citizens and fosters Goodwill among the Desert Cities and Local Agencies. Please reward PDHS Vol's for supporting your ride by making a generous donation. 100% of the proceeds go directly to PDHS. It's a wonderful way to support their ambitious student goals & programs. Many Thanks! 5. Preparation: Preparation is the key to a successful desert ride. That includes the obvious, being well-conditioned for the distance you wish to ride, but it also includes mental prep. Become well-informed about the event. Study the Rider Instructions ahead of time. Knowing what to expect builds confidence and leaves less to chance. It also widens the safely margin. Have a Ride Plan in advance. Use a checklist before leaving home to ensure you have your helmet, shoes, gloves, full water bottles, etc. Make the last checklist item a final visit to the Palm Desert website for last-minute changes, or updates. PDC is the 26th Shadow Tour cycling event. We've learned things can (and usually do) change at the last minute. Weather is a good example. Be flexible! as of 10-15-14). Click here to book rooms. (1) Hampton Inn & Suites, located 1/4 mile from Start/Finish. Rider Special rates apply, based on availability. Click here to book. Sep 30, '15. These jerseys will be available at the event. Price $75. will be mailed in one week, with free shipping! Click here. Price: $80. Price: $80 (Fri) and $85 (Sat). 11. Fineline Custom T-shirt: Pre-ordered optional "Tec" T-shirts will be available at the event. A limited supply of inventory T-shirts will be available. Price: $25 pre-ordered, Fri $27 & Sat: $29. SCS Photoworks, Official Event Photographer. Shadow Tour Staff & Volunteers are excited to see all of you this Saturday! Let's all work together to keep everyone safe. If you see a Palm Desert Century rider make a wrong turn, or appear to need help, please ask if they need a hand. All PDC riders have a Silver, Gold, or Yellow wrist band and helmet numbers. Encourage & watch out for each other out on the course. There are breathtaking views all along the Coachella Valley route. Enjoy yourself, while you take on this "Earn it" century! We wish you a Fun & Safe ride in the sun. Thank you so much for joining us. Roll it safely! There's still time to catch "LAST CHANCE" prices for the 5th Annual 2015 PALM DESERT CENTURY on Sat, Nov 14, '15 in Palm Desert, CA. We're pleased to offer a special discount to past Shadow Tour riders, their friends & family, and members of the Interest List. Sign up Today & Save! Enter promocode SCENIC20 when you register online. It's the last step, so be careful not to miss it. The promocode is also valid for Mail-in and Walk-up Registrations. The discount applies to entry fee only. May not be combined with other offers, and is not retro-active.